Each module provides individual options out of which GSISH candidates can choose offers wich best contribute to their needs. 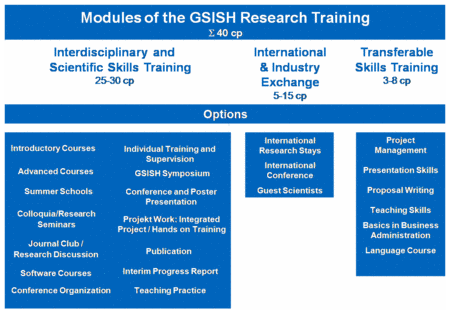 Out of these modules GSISH provides a tailor-made PhD curriculum for every individual doctoral candidate. GSISH doctoral candidates will collect 40 Credit Points during their studies. Within the Ph.D. supervision agreement, an individual training plan is drawn up by the graduate student and his/her supervisors/mentors at the beginning of the doctoral project. The plan specifies the courses, seminars and projects, including the international and industrial exchange, to be taken from each of the modules A through C.
Our doctoral students can choose from a variety of courses offered by TUM, its further education centers and by our national and international partner institutions.